The director of America's first commercial spaceport — now under construction in the New Mexico desert— has resigned, citing pressure from the state's new Republican governor. Rick Homans announced his resignation Wednesday (Jan. 5) as the executive director of the New Mexico Spaceport Authority, the body that oversees Spaceport America. In his resignation letter, Homans said he was told by the administration of Gov. Susana Martinez to resign or be fired. Homans' resignation takes effect at the close of business today (Jan. 7), according to his letter. "It's a natural thing for political appointees to leave during a transition, but we are pleased that the Martinez Administration has made clear their strong support for Spaceport America," Brett Alexander, president of the Commercial Spaceflight Federation, a private industry group, told SPACE.com. "Rick Homans did a terrific job getting the Spaceport to this point. We look forward to working with his successor." Spaceport America is a $212 million facility being built near Truth or Consequences, N.M. It is set to be the home port for the private spaceship company Virgin Galactic, which is developing a fleet of SpaceShipTwo suborbital spaceships to fly space tourists. The launch-and-landing site is scheduled to become fully operational sometime this year. "Homans played a vital role in recruiting Virgin Galactic as the anchor tenant at Spaceport America," Pat Hynes, chair of the International Symposium for Personal and Commercial Spaceflight, said in a statement. "He was a frequent speaker at ISPCS, and we wish him all the best in his next venture." Homans had worked closely with former New Mexico governor Bill Richardson, a champion of the project. 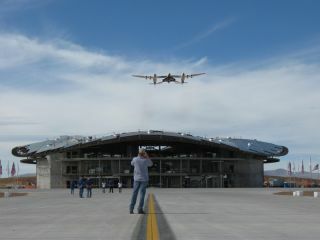 The main runway was dubbed "The Governor Bill Richardson Spaceway" in the spaceport's dedication ceremony last October. Richardson was succeeded this month by Martinez, who won New Mexico's gubernatorial election last November. "While I have embraced this project, it is clear that Governor Martinez is not embracing me," Homans wrote in his letter of resignation. In the letter, he also questioned the Martinez's commitment to the Spaceport America project. "She has to believe in the project and its massive potential to create jobs and impact education," Homans wrote. "She has to become its biggest champion and rally her Administration to support this effort. There is no middle ground — nothing short of complete commitment from Governor Martinez and her Administration will allow this project to achieve its full potential." Martinez has suggested that she wants to roll back the government's involvement and financial contribution to Spaceport America. "The state has already contributed a substantial initial investment to the project — more than half of the project construction costs to date," Martinez told NMPolitics.net last year. "Given our budget realities, additional large investments would be a misguided use of our taxpayer funds." She also said she'd like to privatize more operations at the spaceport. "We must attract more industry and private business to the spaceport facility to assist with future development costs," she told NMPolitics.net. But Homans urged Martinez to adopt the spaceport's cause as her own. "My hope is that Governor Martinez can quickly move beyond viewing Spaceport America as the legacy project of Bill Richardson — the very best thing that can happen is for Governor Martinez to embrace this project as her own legacy," Homans wrote in his letter. "She will be the Governor who opens the first, purpose-built commercial spaceport in the world — and the world will be watching."